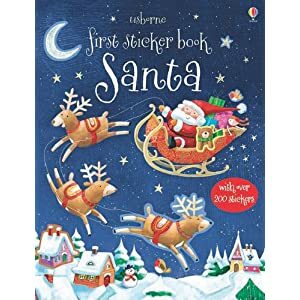 This is such a quality sticker book It has 16 pages of wonderful scenes that follow Santa on his journey which begins with his worksop filled with elves and toys and ends with Santa going to bed after hanging up his suit on Christmas day. The scenes are wonderful and the book contains over 200 stickers to fill them.. The stickers are easy to peel and a good size and varied. The book retails for £4.99. This will bring your child hours of quiet playtime. 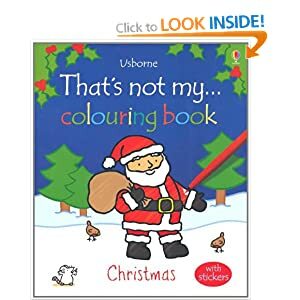 That’s Not My Colouring Book: Christmas, is such a lovely, unique colouring book allso by Usborne. On one page it will have a picture of an iconic Christmas image such as a tree with ‘that’s not my Christmas tree written underneath. On the opposte page is a blank one to colour in and space to fill in the words ‘thats my Christmas tree’ underneath. For children familiar with the Thats not my…Usborne books these are wonderful. There are stickers too! I have 3 sets containing both books to give away as a competition prize! Simply tell me your favourite Christmas image. Follow @Usborne on twitter for an extra entry and tell me in a seperate comment you have. This competition will run for 2 weeks and close on the 1st December at 10 a.m. Good luck! The kids all dressed up on the stage for their navitity play – always makes me cry even if it’s not my son! I would love one of these, well not me personally, my kids, although I can see it would keep them quiet – good for all! has to be kids putting put Sanats Red Wine and Carrots for reindeer – too cute! Anything with a snowy scene in it for me, I love the way snow makes everything look clean and fresh. My favourite Christmas image has to be the delight on the kids faces when they see Father Christmas has been and left their presents under the tree. A lovely red Robin ! Christmas tree with presents underneath. Seeing my daughter’s face on Christmas morning after Santa came for a visit. i love to see a chubby cute robin in our snowy garden! The Robin with his red breast always reminds me of Christmas, evenmore when he is sat on my birdtable with snow falling all around him. My favourite image is a nativity scene. Add ‘Away in a Manger’ sung by children and I’m close to tears! Thanks for posting this lovely giveaway. My favourite Christmas image is the nativity. I always take my girls to the crib service on Christmas eve, it helps them understand what it’s all about. I love watching my older daughter in the nativity play at school too. I follow @Usborne on twitter (@pandcands). I love carol singers in the snow. Dressing the tree and decorating the house with the children and using some of the decorations they made at pre-school and infant classes (Santa, robin, tealight in a decorated jamjar, etc). watching children smiling in awe at Santa! Makes me smile every time! I love Christmas – my favourite Christmas ‘image’ is a picture I have of Alex holding Ellissia last Christmas next to the Christmas tree. It was her first Christmas and I love the closeness of it. I like to hear Christmas carols, reminding me of what christmas is all about. Got to be either a big fat santa or snowman character – nothing more festive than singing “holidays are coming! Anything with twinkling lights against a night sky is my favourite image! my kids faces on christmas morning! My favourite image is trees covered in snow, I love it and it always makes me want to take photos. Love scenes of a dark sky and Fr Christmas travelling across with his sleigh and reindeer. Hated it when I found out he wasn’t real.